A once little-known movement has resulted in recent incidents of exclusion of and discrimination against Jewish students and pro-Israel advocates on America’s college campuses. The Boycott, Divest, and Sanction (BDS) movement, an international Palestinian-led campaign against Israeli businesses and institutions of higher education, continues to grow since its 2005 launch, and is taking root on U.S. campuses in a way that has many concerned. Although largely a symbolic tactic where students vote for the boycotting, divestment, and sanctioning of Israel but are not able to actually force a university to take those actions, the BDS movement is seeing additional momentum. 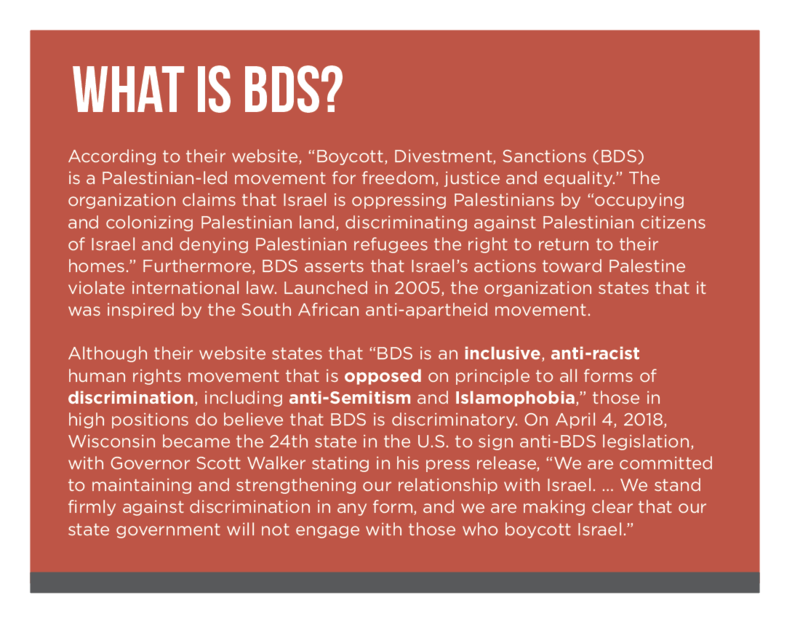 In 2017, the student governments at both the University of Wisconsin-Madison and Pitzger College passed referendums related to divestment from and prohibition of spending funds with companies that do business with Israel in some form. Typically, the BDS resolutions themselves are either ignored or condemned by university officials. Some, like Tammi Rossman-Benjamin, PhD, a lecturer at the University of California, Santa Cruz and co-founder and director of the AMCHA Initiative — a nonprofit that combats and investigates anti-Semitism at colleges and universities — argue that the BDS movement is inherently anti-Semitic. This contention rests on the fact that BDS’s explicit goal is the elimination of the Jewish state, she says, and in order to justify that action, BDS advocates assert that Israel is dangerous and that by extension, Jewish students are as well. David Bernstein, president and CEO of the Jewish Council for Public Affairs, says he finds BDS problematic but doesn’t believe every supporter of the movement is necessarily an anti-Semite. There is a valid distinction between BDS against Zionism — the belief that Jewish people should have their own nation — and its stance against settlement on lands within Palestinian territories, he says. At the City University of New York (CUNY), members of its chapter of Justice in Palestine (SJP) — a national student organization that frequently leads BDS events across the country — argued in a report to CUNY’s chancellor that accusations of anti-Semitism are used to silence their opposition to Israel’s political policies. They have also issued statements following CUNY anti-Israel rallies condemning any anti-Semitic statements made at such rallies, clarifying that SJP opposes the ideology of Zionism rather than the Jewish people. The AMCHA Initiative, however, has conducted three studies that explore the correlation between certain kinds of expression, such as BDS events on campus and acts of anti-Jewish hostility, and have found a clear link. “Schools that are promoting BDS or other kinds of anti-Zionist rhetoric … are three to eight times more likely to have incidents that target Jewish students for harm,” says Rossman-Benjamin. These have included assault, the suppression of speech, and destruction of property. Of particular concern to Rossman-Benjamin is the call to boycott Israeli colleges and universities. Unlike BDS resolutions against Israeli businesses, which are largely symbolic, boycotting Israeli institutions of higher education has very real consequences for American students and academics. “It not only hurts Israeli universities and scholars, it hurts any [U.S.] student or faculty member who wants to study in Israel,” she says. In the U.S., some BDS supporters have managed to ensure that Jewish student groups are excluded from participation in social justice causes and events — a fact which is particularly concerning to Ken Waltzer, PhD, the former director of Jewish Studies at Michigan State University. Waltzer currently leads the Academic Engagement Network (AEN), an organization of U.S. college and university faculty opposed to BDS. “Jewish students want to be part of progressive things [occurring] on campus, and increasingly in these arenas, a test of how progressive you are is whether you are anti-Israel,” he says. A 2016 incident at Brown University and the Rhode Island School of Design (RISD) illustrates this trend. When the Brown-RISD chapter of the Jewish student organization Hillel attempted to co-sponsor a campus event on transgender activism, Brown’s SJP posted a petition on Change.org stating that the event’s speaker — transgender activist Janet Mock — should not come to the university because “Hillel [supports] the Israeli state’s policies of occupation and racial apartheid.” Mock ended up cancelling. For Rossman-Benjamin, such incidents are about all students, not just those who are Jewish. Regardless of religion or social identity, students are individuals, and they have the right to express themselves on campus, she says. The effect on Jewish students who are silenced or told they are not welcome is that they disengage from campus life and hesitate to express their Jewish identity at all because it comes at too high a cost, she says. 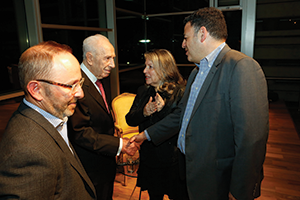 David Bernstein meets Shimon Peres, former president and prime minister of Israel. Waltzer and Bernstein both agree that rather than suppressing their identity and beliefs, Jewish people should focus on communicating with broader campus communities. “It’s critical that Jewish students, Jewish faculty, the Hillels, and others engage the undecided on Israel, people who might have legitimate criticism of the country but may not yet have decided where they stand on BDS,” says Bernstein. To this end, the AEN offers a micro-grant program that has funded film festivals, panel discussions, performance groups, and more to make the Middle East and Israel the subject of rigorous discussion apart from polarizing ideological differences. “Anything that works to normalize Israel, anything we can do to talk about Israel beyond the conflict, especially with people who don’t know much about the Middle East [can reduce anti-Semitic sentiment],” says Waltzer. AEN supports free speech for all faculty, he says, but campus leadership should always respond to instances where free speech includes anti-Semitic messages. Ultimately, anti-Zionist or anti-Israel rhetoric qualifies as protected speech under the First Amendment. In light of this fact, other experts, such as Bernstein and Alterman, agree that publicly condemning such speech is not the best approach. “In these situations, I favor more engagement to help [people] see that [anti-Zionist rhetoric] is not helping the cause of peace,” says Bernstein. Alterman has advised Hillel International to encourage its campus chapters to engage in dialogue with Palestinian students rather than adopt a policy called “Standard of Partnership,” which prohibits the co-sponsorship of any projects with individuals or organizations that support BDS. Ginger O’Donnell is an editorial assistant and contributing writer for INSIGHT Into Diversity. This article ran in our May 2018 issue.